Researchers at Boğaziçi University have developed a tablet-based, wireless audiometer. The device is compatible with new generation technology and will play a significant role in the diagnosis of hearing loss. The audiometer developed by Boğaziçi ARGE, part of the university’s Technopark, is a wireless, tablet-based application equipped with a practical user interface. 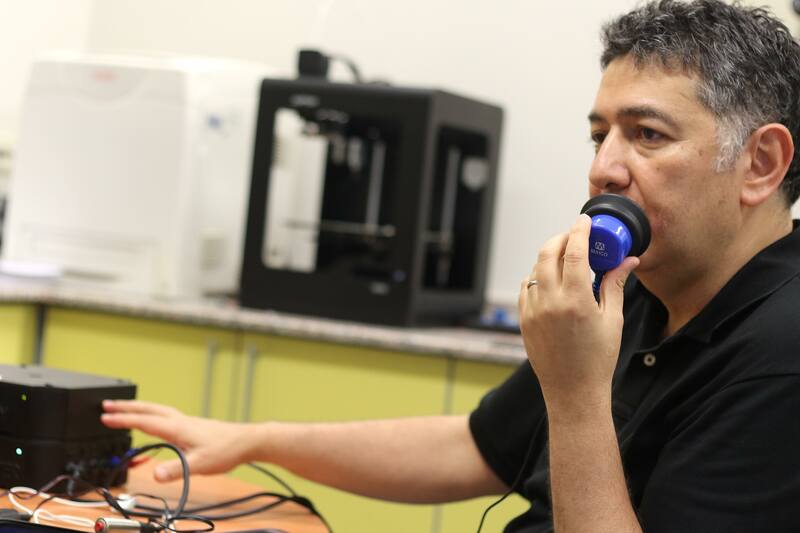 The device was developed with the contributions of a group of Boğaziçi University students led by Prof. Mehmet Özkan from the Institute of Biomedical Engineering. The new audiometer, called BOARGE, will facilitate the diagnosis and measurement of hearing loss in hospitals and clinics, and will also offer an opportunity to conduct hearing impairment tests for screening purposes in the work place. “Audiometric devices are produced by a few manufacturers around the world,” explained Özkan. “The patient enters a sound booth for audiometric assessment. The audiologist outside the booth determines the patient’s hearing threshold by transmitting a range of sounds of various tones and frequencies. The audiometer inside the sound booth is connected to the device outside by cables transmitting analogue signals. Even if these two devices are very carefully calibrated, when taken back to the clinic, the worn, oxidized cables and connections may cause signal losses above tolerable levels.